If people ask me what is my hobby, I'd say there are many but one is reading. However, just to make things clear, I only read novel and comic. I know this would benefit me nothing to my study but sometimes, it's a habit and I am born to like it. It's pretty hard to kick it out. I'm not willing to kick it though. 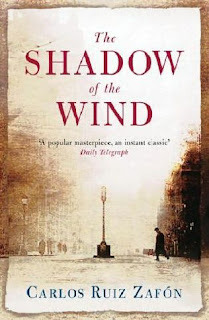 Anyway, this, The Shadow of the Wind, is just another piece that I read. I just finished it this evening. I'm not really good at picking a good book but I assure you that this is a very nice one. It moved me since the start. And it keeps me there till the last page. It first caught me with its title. Then when I went through the summary, Barcelona stopped me cos this city is where I wish to pay a visit. And another part that interest me is the cemetery of the lost books where the little boy of 10, Daniel, was brought to see by his father and where he discovered the book shadow of the wind written by Julian Carax, an author whose mysteries is great wonder of Daniel. Will start mine soon. Lol... What do you like most about it?